The Green New Deal (GND) is a set of proposed economic stimulus programs in the United States that aim to address climate change and economic inequality. The name refers to the New Deal, a set of social and economic reforms and public works projects undertaken by President Franklin D. Roosevelt in response to the Great Depression. The Green New Deal combines Roosevelt's economic approach with modern ideas such as renewable energy and resource efficiency. 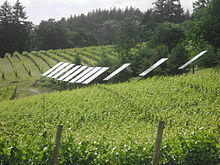 A previous policy similar to the Green New Deal was the 2008 tax incentive for solar panels. If you have put a windmill in your yard or some solar panels on your roof, bless your heart. But we will only green the world when we change the very nature of the electricity grid – moving it away from dirty coal or oil to clean coal and renewables. And that is a huge industrial project – much bigger than anyone has told you. Finally, like the New Deal, if we undertake the green version, it has the potential to create a whole new clean power industry to spur our economy into the 21st century. This approach was subsequently taken up by the Green New Deal Group, which published its eponymous report on July 21, 2008. The concept was further popularized and put on a wider footing when the United Nations Environment Programme (UNEP) began to promote it. On October 22, 2008 UNEP's Executive Director Achim Steiner unveiled the Global Green New Deal initiative that aims to create jobs in "green" industries, thus boosting the world economy and curbing climate change at the same time. It was then turned into an extensive plan by the Green Party of the United States. It was a key part of the platform of Green Party presidential candidate Jill Stein in 2012 and 2016, as well as Howie Hawkins, who helped to write it, in his campaign for governor of New York. The Climate Mobilization, which advocates a "World War II-scale economic mobilization to restore a safe climate." The think tank Data for Progress laid out a progressive vision in their policy report "A Green New Deal" in September 2018. The Global Greens support a Global Green New Deal. Green Party of the United States has endorsed the Green New Deal in its party platform. The Heinrich Böll Foundation published proposals for a Green New Deal in Germany, the European Union, as well as North America, Israel, and Ukraine. UNISTATA EDC, which advocates economic development programs to increase income, education and wellbeing in the Southeastern US. The United Nations Environment Programme launched a Green Economy Initiative known as the "Global Green New Deal". Representative Alexandria Ocasio-Cortez (center) speaks on the Green New Deal with Senator Ed Markey (right) in front of the Capitol Building in February 2019. During the 2012 presidential election, the Green Party presidential candidate Jill Stein proposed a Green New Deal as part of her campaign priorities. The Green Party continued to suggest a Green New Deal in their rebuttal to the 2018 State of the Union speech. The Green New Deal is officially part of the platform of the Green Party of the United States. A "Green New Deal" wing began to emerge in the Democratic Party after the November 2018 elections. A possible program in 2018 for a "Green New Deal" assembled by the think tank Data for Progress was described as "pairing labor programs with measures to combat the climate crisis." A November 2018 article in Vogue stated, "There isn’t just one Green New Deal yet. For now, it’s a platform position that some candidates are taking to indicate that they want the American government to devote the country to preparing for climate change as fully as Franklin Delano Roosevelt once did to reinvigorating the economy after the Great Depression." A week after the 2018 midterm elections, climate justice group Sunrise Movement organized a protest in Nancy Pelosi's office calling on Nancy Pelosi to support a Green New Deal. On the same day, freshman congresswoman Alexandria Ocasio-Cortez launched a resolution to create a committee on the Green New Deal. Following this, several candidates came out supporting a "Green New Deal", including Deb Haaland, Rashida Tlaib, Ilhan Omar, and Antonio Delgado. They were joined in the following weeks by Reps. John Lewis, Earl Blumenauer, Carolyn Maloney, and José Serrano. By the end of November, eighteen Democratic members of Congress were co-sponsoring a proposed House Select Committee on a Green New Deal, and incoming representatives Ayanna Pressley and Joe Neguse had announced their support. Draft text would task this committee with a “'detailed national, industrial, economic mobilization plan' capable of making the U.S. economy 'carbon neutral' while promoting 'economic and environmental justice and equality,'" to be released in early 2020, with draft legislation for implementation within 90 days. Organizations supporting a Green New Deal initiative included 350.org, Greenpeace, Sierra Club, and Friends of the Earth. Opponents noted that the costs of a Green New Deal had not been fully determined, and that achieving 100% renewable energy might not be possible. Paul Bledsoe of the Progressive Policy Institute expressed concern that setting unrealistic "aspirational" goals of 100% renewable energy, as in the Ocasio-Cortez proposal, "does a disservice to the real seriousness of climate change", and could undermine "the credibility of the effort." A Sunrise Movement protest on behalf of a Green New Deal at the Capitol Hill offices of Nancy Pelosi and Steny Hoyer on December 10, 2018 featured Lennox Yearwood and speakers as young as age 7, resulting in 143 arrests. Euronews, the pan-European news organization, displayed video of youth with signs saying "Green New Deal," "No excuses", and "Do your job" in its "No Comment" section. On December 14, 2018, a group of over 300 local elected officials from 40 states issued a letter endorsing a Green New Deal approach. That same day, a poll released by Yale Program on Climate Change Communication indicated that although 82% of registered voters had not heard of the "Green New Deal," it had strong bi-partisan support among voters. A non-partisan description of the general concepts behind a Green New Deal resulted in 40% of respondents saying they “strongly support”, and 41% saying they “somewhat support” the idea. On January 10, 2019 over 600 organizations submitted a letter to Congress declaring support for policies to reduce greenhouse gas emissions. This includes ending fossil fuel extraction and subsidies, transitioning to 100% clean renewable energy by 2035, expanding public transportation, and strict emission reductions rather than reliance on carbon emission trading. 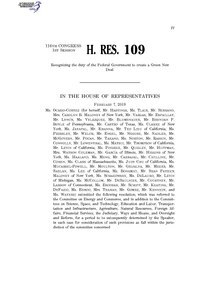 Ocasio-Cortez's first piece of sponsored legislation: H.Res.109 – 116th Congress (2019–2020) Recognizing the duty of the Federal Government to create a Green New Deal. Representative Alexandria Ocasio-Cortez and Senator Ed Markey released a fourteen-page resolution for their Green New Deal on February 7, 2019. The approach pushes for transitioning the United States to use 100% renewable, zero-emission energy sources, including investment into electric cars and high-speed rail systems, and implementing the "social cost of carbon" that has been part of Obama administration's plans for addressing climate change within 10 years. Besides providing new jobs, this Green New Deal is also aimed to address poverty by aiming much of the improvements in the "frontline and vulnerable communities" which include the poor and disadvantaged people. To gain additional support, the resolution includes calls for universal health care, fair minimum wages, and preventing monopolies. While this resolution did not identify where the funding for this would come from, the conservative American Action Forum estimated that a similar proposal would cost US$1 trillion without taking into account new investments to achieve the resolution's goals. Various perspectives emerged in late 2018 as to whether to form a committee dedicated to climate, what powers such a committee might be granted, and whether the committee would be specifically tasked with developing a Green New Deal. In contrast, Representative Ro Khanna thought that creating a Select Committee specifically dedicated to a Green New Deal would be a "very commonsense idea", based on the recent example of the Select Committee on Energy Independence and Global Warming (2007-2011), which had proven effective in developing a 2009 bill for cap-and-trade legislation. Proposals for the House Select Committee on the Climate Crisis did not contain “Green New Deal" language and lacked the powers desired by Green New Deal proponents, such as the ability to subpoena documents or depose witnesses. Rep. Kathy Castor of Florida was appointed to chair the committee. On January 10, 2019, a letter signed by 626 organizations in support of a Green New Deal was sent to all members of Congress. It called for measures such as "an expansion of the Clean Air Act; a ban on crude oil exports; an end to fossil fuel subsidies and fossil fuel leasing; and a phase-out of all gasoline-powered vehicles by 2040." Six major environmental groups did not sign on to the letter: the Sierra Club, the Natural Resources Defense Council, the Environmental Defense Fund, Mom’s Clean Air Force, Environment America, and the Audubon Society. The MIT Technology Review responded to the letter with an article titled, "Let’s Keep the Green New Deal Grounded in Science." The MIT article states that, although the letter refers to the "rapid and aggressive action" needed to prevent the 1.5 ˚C of warming specified in the UN climate panel’s latest report, simply acknowledging the report's recommendation is not sufficient. If the letter's signatories start from a position where the options of carbon pricing, carbon capture for fossil plants, hydropower, and nuclear power, are not even on the table for consideration, there may be no feasible technical means to reach the necessary 1.5 ˚C climate goal. A report in Axios suggested that the letter's omission of a carbon tax, which has been supported by moderate Republicans, did not mean that signatories would oppose carbon pricing. The Director of the Center for Science, Technology, and Innovation Policy at George Mason University was quoted as saying, "As long as organizations hold onto a rigid set of ideas about what the solution is, it’s going to be hard to make progress ... And that’s what worries me." As of January 2019, models for structuring a Green New Deal remain in the initial stages of discussion. Although Chuck Schumer has indicated that measures to address climate change and renewable energy must be included in a 2019 infrastructure package, as of December 2018, articles describing his position referred to it as "green infrastructure" rather than as a Green New Deal. On January 17, 2019, prospective presidential candidate Jay Inslee called for Green New Deal goals of "net-zero carbon pollution by midcentury" and creating "good-paying jobs building a future run on clean energy" in a Washington Post op-ed. However, he framed these efforts in terms of national mobilization, saying "Confronting climate change will require a full-scale mobilization — a national mission that must be led from the White House." An article in The Intercept characterizes a Green New Deal more broadly, as economic planning and industrial policy measures which would enable mobilization for the environment, similar to the economic mobilization for World War II, and similar to the internal planning of large corporations. The article quotes an expert who states that imposing jail terms for failure to meet emissions targets "may sound aggressive by today’s standards, but [it] has been par for the course at other points in American history when the country has faced existential threats." Economist Stephanie Kelton (a proponent of Modern Monetary Policy) and others  argue that natural resources, including a stable, livable climate, are limited resources, whereas money -following the abandonment of the gold standard- is really just a legal and social tool that should be marshalled to provide for sustainable public policies. To this end, a mix of policies and programs could be adopted, including tax incentives and targeted taxes, reformed construction and zoning standards, transportation fleet electrification, coastal shoreline hardening, Farm Bill subsidies linked to carbon capture and renewables generation, and much more. Practically, Kelton argues that the key to implementation is garnering enough political support, rather than becoming fixated on specific "pay-fors." Many proposed Green New Deal programs would generate significant numbers of new jobs. One proposed model for funding says that "funding would come primarily from certain public agencies, including the U.S. Federal Reserve and 'a new public bank or system of regional and specialized public banks.'" This model, which has been endorsed by over 40 House members, has been compared to the work of the Kreditanstalt für Wiederaufbau (KfW, or “Reconstruction Credit Institute,” a large German public sector development bank), the China Development Bank, and the Asian Infrastructure Investment Bank. Although the non-specific nature of current GND proposals has become a concern for some Greens, one writer from the Columbia University Earth Institute views the lack of specificity as a strength, noting that: "FDR’s New Deal was a series of improvisations in response to specific problems that were stalling economic development. There was no master plan, many ideas failed, and some were ended after a period of experimentation. But some, like social security and the Security and Exchange Commission’s regulation of the stock market, became permanent American institutions." Existing programs training workers in green skills include a program called Roots of Success, founded in 2008 to bring low-income people into living wage professions. Funding for Roots of Success came from the $90 billion in green initiatives incorporated in the American Recovery and Reinvestment Act of 2009. About 12% of ARRA funding went to green investment, and some of these initiatives were successful. A Jan. 2019 article in Politico stated that, "U.S. wind capacity has more than tripled since 2008, while solar capacity is up more than sixfold. LEDs were 1 percent of the lighting market in 2008; now they’re more than half the market. There were almost no plug-in electric vehicles in 2008; now there are more than 1 million on U.S. roads." Although ARRA's green stimulus projects are of interest for developing proposals for a Green New Deal, its mixed results included both "boosting innovative firms" such as Tesla, and the $535 million failure of the Solyndra solar company." These initial efforts at green stimulus are described as a "cautionary tale." It remains necessary to develop mechanisms for promoting large-scale green business development, as it is unclear whether focusing on job creation programs alone will result in optimizing the climate impact of new jobs. Economist Edward Barbier, who developed the "Global Green New Deal" proposal for the United Nations Environment Programme in 2009, opposes "a massive federal jobs program," saying "The government would end up doing more and more of what the private sector and industry should be doing." Barbier prefers carbon pricing, such as a carbon tax or cap-and-trade system, in order to "address distortions in the economy that are holding back private sector innovation and investments in clean energy." In the US, Robert Pollin characterized the concept of a "Green New Deal" as "egalitarian green growth," indicating that the seriousness of concerns about climate is also giving rise to alternative Degrowth proposals to contract economies. Republican politicians have pointed to language found in a "Frequently Asked Questions" section posted to Rep. Ocasio-Cortez's website, now only viewable on the Wayback Machine. Most criticisms centred on a line promising economic security to those "unwilling to work". Green New Deal advisor Robert C. Hockett claimed in a Fox News interview that this line must have only been present in doctored versions of the summary and later admitted that he was mistaken. Rep. Liz Cheney (R-WY) has entered the document into congressional record. On February 13, 2019, Rep. Mark Walker (R-NC) released a parody video on his verified Twitter account comparing the Green New Deal to the failed Fyre Festival, using the hashtag #GNDisFyre. When Senator Dianne Feinstein (D-CA) was confronted by youth associated with the Sunrise Movement on why she doesn't support the Green New Deal, she told them "there’s no way to pay for it" and that it could not pass a Republican controlled senate. In a tweet following the confrontation, Feinstein said that she remains committed "to enact real, meaningful climate change legislation"
↑ Jepps, Jim; Read, Rupert (January 21, 2009). "A Green New Deal". Red Pepper. Retrieved April 13, 2018. ↑ "How new a deal?". economist.com. November 20, 2008. Retrieved April 13, 2018. ↑ Meyer, Robinson. "The Green New Deal Hits Its First Major Snag". The Atlantic. Retrieved January 31, 2019. There’s not a single, official Green New Deal. Much like “Medicare for All,” “Green New Deal” refers more to a few shared goals than to a completed legislative package. (The original New Deal basically worked the same way.) Now a number of environmental groups are trying to make those goals more specific. But they’re running into a snag: The bogeymen that haunted old progressive climate policies are suddenly back again. And the fights aren’t just about nuclear power. 1 2 ""Why Al Gore is on board with the Green New Deal"". Archived from the original on December 14, 2018. Retrieved December 13, 2018. ↑ Jeremy Lovell (July 21, 2008) "Climate report calls for green 'New Deal'", Reuters. ↑ Hilary French, Michael Renner and Gary Gardner: Toward a Transatlantic Green New Deal Archived March 29, 2014, at the Wayback Machine The authors state: "Support is growing around the world for an integrated response to the current economic and environmental crises, increasingly referred to as the "Green New Deal". The term is a modern-day variation of the U.S. New Deal, an ambitious effort launched by President Franklin Roosevelt to lift the United States out of the Great Depression. The New Deal of that era entailed a strong government role in economic planning and a series of stimulus packages launched between 1933 and 1938 that created jobs through ambitious governmental programs, including the construction of roads, trails, dams, and schools. Today's Green New Deal proposals are also premised on the importance of decisive governmental action, but incorporate policies to respond to pressing environmental challenges through a new paradigm of sustainable economic progress." ↑ Roberts, David (December 21, 2018). "The Green New Deal, explained". Vox. Plenty of Democratic politicians support policies that would reduce climate pollution – renewable energy tax credits, fuel economy standards, and the like – but those policies do not add up to a comprehensive solution, certainly nothing like what the Intergovernmental Panel on Climate Change (IPCC) suggests is necessary. ↑ Kaufman, Alexander C (June 30, 2018). "What's the 'Green New Deal'? The surprising origins behind a progressive rallying cry". Grist. Archived from the original on November 13, 2018. Retrieved November 13, 2018. ↑ Thomas L. Friedman: A Warning From The Garden Archived 2016-12-19 at the Wayback Machine, The New York Times. January 19, 2007. ↑ Kaufman, Alexander C. (January 25, 2019). "Former U.N. leader Ban Ki-moon just endorsed Democrats' fight for a Green New Deal". Grist. Retrieved January 27, 2019. 1 2 Santus, Rex (February 7, 2019). "AOC's Green New Deal has the backing of every major 2020 candidate". Vice. Retrieved February 8, 2019. ↑ "Randy Bryce's Environmental Plan". Randy Bryce for Congress. Archived from the original on April 22, 2018. Retrieved April 22, 2018. 1 2 Mathiesen, Karl (2019-02-14). "Labour scrambles to develop a British Green New Deal". Climate Change News. Retrieved 2019-02-23. ↑ Galbraith, James K. (2018). "Comments and Interviews". James K Galbraith's Website, University of Texas Inequality Project,. Retrieved January 19, 2019. ↑ Teirstein, Zoya (January 25, 2019). "Kirsten Gillibrand doesn't just support the 'idea' of a Green New Deal, she's wholly behind it". Grist. Retrieved January 27, 2019. ↑ Burke, Michael (January 25, 2019). "Kamala Harris endorses Ocasio-Cortez's 'Green New Deal'". The Hill. Retrieved February 8, 2019. ↑ "Search". Archived from the original on November 17, 2018. Retrieved November 17, 2018. ↑ Henderson, Bruce (December 11, 2018). "Rep. Kennedy announces support for the Green New Deal". Village 14. Retrieved January 11, 2019. ↑ LaChance, Naomi (November 30, 2018). "Naomi Klein on the Urgency of a 'Green New Deal' for Everyone". Truthdig: Expert Reporting, Current News, Provocative Columnists. Archived from the original on December 3, 2018. Retrieved December 2, 2018. ↑ Paul Krugman (January 1, 2019). "Hope for a Green New Year". The New York Times. p. A18. Retrieved January 1, 2019. ↑ Evans, Greg (2019-02-01). "Bill Maher Sees "Glimmer Of Hope" For Climate Change: Americans Less Stupid". Deadline. Retrieved 2019-02-21. ↑ Markey, Edward. "New Congress will bring a green wave on climate change". BostonGlobe.com. Retrieved January 11, 2019. ↑ Schlanger, Zoë. "Ocasio-Cortez's climate plan is the only one that matches scientific consensus on the environment". Quartz. Archived from the original on July 1, 2018. Retrieved July 3, 2018. ↑ II, Richard N. Ojeda (December 6, 2018). "Absolutely". @voteojeda2020. Retrieved January 10, 2019. ↑ Lewis, Stephen (2011-02-21). "Green future is the only way ahead". York Press. Retrieved 2019-02-23. ↑ "Dems rally for Green New Deal". November 30, 2018. Archived from the original on December 1, 2018. Retrieved November 30, 2018. ↑ "Bernie Sanders and Alexandria Ocasio-Cortez Are Pushing a Bold New Plan to Tackle Climate Change". Retrieved January 15, 2019. ↑ Ponsot, Elisabeth (November 5, 2012). "The green new deal". Need to Know (TV program), PBS. Archived from the original on November 13, 2018. Retrieved November 13, 2018. ↑ Singman, Brooke (January 9, 2019). "Growing number of 2020 Democrats supporting 'Green New Deal'". Fox News. Retrieved January 27, 2019. ↑ "Congresswoman Lori Trahan Joins Colleagues to Introduce Green New Deal Legislation". U.S. Representative Lori Trahan. 2019-02-08. Retrieved 2019-02-16. 1 2 Read, Bridget (November 2, 2018). "Watch Bria Vinaite Explain the Green New Deal". Vogue. Archived from the original on November 13, 2018. Retrieved November 13, 2018. ↑ "Elizabeth Warren backs the "idea" of a Green New Deal". Axios. Archived from the original on January 2, 2019. Retrieved January 2, 2019. ↑ Williams, Zoe (2018-12-23). "Labour owes it to its supporters to become the party of remain". The Guardian. Retrieved 2019-02-23. ↑ Wyden, Ron (January 10, 2019). "It's Time for a 'Green New Deal'". Politico. Retrieved January 19, 2019. ↑ Yang, Andrew (2019-01-09). ""Aligned and on board"". Twitter. Retrieved 2019-02-20. 1 2 Colón, Christina (December 10, 2018). "Nearly 150 Climate Activists Arrested in Mass Demonstration for Green New Deal". Sojourners. Archived from the original on December 17, 2018. Retrieved December 16, 2018. ↑ "Search". Retrieved December 1, 2018. ↑ "Protests for Social Justice: A Green New Deal for Israel?". boell.de. Heinrich Böll Foundation. Archived from the original on June 26, 2015. Retrieved October 12, 2016. ↑ "Green New Deal in Ukraine? The Energy Sector and modernizing a National Economy". boell.de. Heinrich Böll Foundation. Archived from the original on July 4, 2018. Retrieved October 12, 2016. ↑ "Search". neweconomics.org. Archived from the original on December 8, 2015. Retrieved October 12, 2016. ↑ "How are we doing on a 'Green New Deal?'". Open Democracy. October 7, 2018. Archived from the original on November 13, 2018. Retrieved November 13, 2018. 1 2 Golden, Hannah. "The Green New Deal Is Challenging This Old Myth About Fighting Climate Change". Elite Daily. Archived from the original on December 8, 2018. Retrieved December 8, 2018. ↑ "in 1 minuten". Global Marshall Plan (in German). Retrieved January 3, 2019. ↑ Friedersdorf, Conor (May 21, 2012). "The 3 Green Party Candidates and Their Disappointing Platforms". The Atlantic. Archived from the original on November 15, 2018. Retrieved November 14, 2018. ↑ "Green Party Rebuttal to President Trump's 2018 State of the Union Address". Common Dreams. Archived from the original on November 13, 2018. Retrieved November 13, 2018. ↑ "Green New Deal". GPUS. Archived from the original on November 17, 2018. Retrieved November 17, 2018. ↑ "GND-Full Language". GPUS. Archived from the original on December 8, 2018. Retrieved November 17, 2018. ↑ Kaufman, Alexander C. (November 7, 2018). "Democrats' Green New Deal Wing Takes Shape Amid Wave Of Progressive Climate Hawk Wins". Huffington Post. Archived from the original on November 13, 2018. Retrieved November 13, 2018. ↑ Carlock, Greg; McElwee, Sean. "Why the Best New Deal Is a Green New Deal". The Nation. ISSN 0027-8378. Archived from the original on November 13, 2018. Retrieved November 13, 2018. ↑ Kahn, Brian. "Most Americans Think We Can Save the Planet and Create Jobs at the Same Time". Earther. Archived from the original on November 13, 2018. Retrieved November 13, 2018. ↑ "Green New Deal Report". Data For Progress. Retrieved November 13, 2018. ↑ Roberts, David (November 15, 2018). "Alexandria Ocasio-Cortez is already pressuring Nancy Pelosi on climate change". Vox. Archived from the original on November 28, 2018. Retrieved December 2, 2018. ↑ Corbett, Jessica (November 7, 2018). "Saving Planet With 'Green New Deal' Proves Popular as Climate Hawks Celebrate Midterm Victories". Common Dreams. Archived from the original on November 13, 2018. Retrieved November 13, 2018. ↑ Burke, Michael (November 18, 2018). "John Lewis joins Ocasio-Cortez on climate change push". TheHill. Archived from the original on November 21, 2018. Retrieved December 8, 2018. ↑ Germanos, Andrea (November 30, 2018). "As Number of Dems Backing Green New Deal Swells to 18, Campaigners Demand All of Party 'Stand Up to Fossil Fuel Billionaires'". Common Dreams. Archived from the original on December 2, 2018. Retrieved December 2, 2018. ↑ Gamboa, Suzanne (November 30, 2018). "Ocasio-Cortez, diverse lawmakers prioritize climate change with 'Green New Deal'". NBC News. Archived from the original on December 2, 2018. Retrieved December 2, 2018. ↑ Klein, Naomi (November 27, 2018). "The Game-Changing Promise of a Green New Deal". The Intercept. Archived from the original on November 27, 2018. Retrieved December 8, 2018. 1 2 Willis, Jay (December 6, 2018). "How Alexandria Ocasio-Cortez's "Green New Deal" Might Help Save the Planet". GQ. Archived from the original on December 7, 2018. Retrieved December 8, 2018. 1 2 3 4 5 Homan, Timothy R. (November 24, 2018). "Five things to know about Ocasio-Cortez's 'Green New Deal'". TheHill. Archived from the original on November 26, 2018. Retrieved December 2, 2018. ↑ "Climate protest at Pelosi's office spurs arrests". Euronews. December 11, 2018. Archived from the original on December 17, 2018. Retrieved December 16, 2018. ↑ Keck, Catie. "Earther - Hundreds of Local and State Officials Just Endorsed Alexandria Ocasio-Cortez's Green New Deal". Gizmodo. Archived from the original on December 16, 2018. Retrieved December 16, 2018. ↑ "At COP24 Climate Talks in Katowice, 300+ Elected Officials from 40 States Call for Phasing Out Fossil Fuels, Green New Deal Approach". Elected Officials to Protect America. December 14, 2018. Archived from the original on December 17, 2018. Retrieved December 16, 2018. ↑ Gustafson, Abel (December 14, 2018). "The Green New Deal has Strong Bipartisan Support". Yale Program on Climate Change Communication. Archived from the original on December 18, 2018. Retrieved December 18, 2018. ↑ "Progressive Green New Deal Letter to Congress" (PDF). ↑ DePillis, Lydia (February 7, 2019). "Ocasio-Cortez's Green New Deal: What's in it". CNN. Retrieved February 7, 2019. ↑ "Resolution: Recognizing the duty of the Federal Government to create a Green New Deal" (PDF). United States House of Representatives. February 7, 2019. Retrieved February 7, 2019. 1 2 Cama, Timothy (November 30, 2018). "Dems rally for Green New Deal". TheHill. Archived from the original on December 1, 2018. Retrieved December 2, 2018. ↑ Cama, Timothy (January 2, 2019). "House Dems formalize climate committee plans without Green New Deal language". TheHill. Retrieved January 19, 2019. ↑ Meyer, Robinson (December 28, 2018). "Democrats Establish a New House 'Climate Crisis' Committee". The Atlantic. Retrieved January 19, 2019. 1 2 "Climate change: Meet the Florida congresswoman leading the House charge". USA TODAY. Retrieved January 19, 2019. ↑ Gonyea, Don (December 30, 2018). "House Democrats Form New 'Climate Crisis' Committee". National Public Radio. Retrieved January 19, 2019. 1 2 3 Meyer, Robinson (January 18, 2019). "The Green New Deal Hits Its First Major Snag". The Atlantic. Retrieved January 19, 2019. 1 2 Kahn, Brian. "More Than 600 Environmental Groups Just Backed Ocasio-Cortez's Green New Deal". Earther. Retrieved January 19, 2019. ↑ Atkin, Emily (January 15, 2019). "Some of the Biggest Green Groups Have Cold Feet Over the "Green New Deal"". The New Republic. ISSN 0028-6583. Retrieved January 19, 2019. 1 2 Temple, James. "Let's keep the Green New Deal grounded in science". MIT Technology Review. Retrieved January 19, 2019. ↑ Geman, Ben (January 10, 2019). "Environmental groups pressure House for "visionary" measures to support the Green New Deal". Axios. Retrieved January 19, 2019. ↑ Mali, Meghashyam (December 7, 2018). "Overnight Energy: Schumer demands climate measures in infrastructure bill | OPEC, Russia to cut oil output | EPA looks to ease Obama water rule". The Hill. Archived from the original on December 8, 2018. Retrieved December 8, 2018. ↑ Levitz, Eric. "Schumer to Trump: Give Us Green Infrastructure, or We'll Give You None". New York - Intelligencer. Archived from the original on December 9, 2018. ↑ Inslee, Jay (January 17, 2019). "The next president must make climate change the top priority". Washington Post. Retrieved January 19, 2018. ↑ Aronoff, Kate (December 5, 2018). "With a Green New Deal, Here's What the World Could Look Like for the Next Generation". The Intercept. Archived from the original on December 5, 2018. Retrieved December 8, 2018. ↑ Kelton, Stephanie; Bernal, Andres; Carlock, Greg (November 30, 2018). "We Can Pay For A Green New Deal". Huffington Post. Archived from the original on December 21, 2018. Retrieved December 21, 2018. ↑ Kelton, Stephanie; Bernal, Andres; Carlock, Greg (November 30, 2018). "We Can Pay For A Green New Deal". Huffington Post. Retrieved January 19, 2019. ↑ Brown, Ellen (January 25, 2019). "The Financial Secret Behind Germany's Green Energy Revolution". Common Dreams. Retrieved January 27, 2019. ↑ Siegel, Josh (January 24, 2019). "Greens want 2020 Democrats to go beyond vague 'Green New Deal' support". Washington Examiner. Retrieved January 27, 2019. ↑ Cohen, Steve (January 14, 2019). "The Politics of a Green New Deal". State of the Planet - News from The Earth Institute, Columbia University. Retrieved January 27, 2019. ↑ Dembicki, Geoff; Cheadle, Harry (December 7, 2018). "The Left Thinks a 'Green New Deal' Could Save Earth and Destroy the GOP". Vice. Archived from the original on December 8, 2018. Retrieved December 8, 2018. 1 2 Lavelle, Marianne (January 3, 2019). "New Congress Members See Climate Solutions and Jobs in a Green New Deal". InsideClimate News. Retrieved January 19, 2019. 1 2 3 Grunwald, Michael. "The Trouble With the 'Green New Deal'". POLITICO Magazine. Retrieved January 19, 2019. ↑ Schallhorn, Kaitlyn (January 11, 2019). "What is the Green New Deal? A look at the economic and climate concept pushed by progressives". Fox News. Retrieved January 19, 2019. ↑ Pollin, Robert (July–August 2018). "De-Growth vs a Green New Deal". New Left Review 112. Archived from the original on November 13, 2018. Retrieved November 13, 2018. ↑ Trump, Donald (February 2019). "US Presidential Twitter Feed". Twitter.com. Archived from the original on February 9, 2019. Retrieved February 9, 2019. ↑ "Green New Deal FAQ | Representative Alexandria Ocasio-Cortez". archive.org. 2019-02-07. Retrieved 2019-02-14. ↑ Stein, Jeff; Weigel, David (2019-02-11). "Ocasio-Cortez retracts erroneous information about Green New Deal backed by 2020 Democratic candidates". The Washington Post. Retrieved 2019-02-21. ↑ Chamberlain, Samuel (2019-02-13). "Rep. Liz Cheney enters draft summary of Green New Deal into Congressional Record". Fox News. Retrieved 2019-02-14. ↑ Walker, Rep Mark (2019-02-13). "After the success of the Fyre Festival, we bring you the Green New Deal. #GNDisFyrepic.twitter.com/uNzT42ZbNV". @RepMarkWalker. Retrieved 2019-02-14. ↑ Shaw, Adam (2019-02-13). "Green New Deal mocked in Fyre Festival parody, as GOP turns plan into punching bag". Fox News. Retrieved 2019-02-14. ↑ "Nancy Pelosi: 'I'm Very Excited About It All and I Welcome the Green New Deal'". Retrieved 2019-02-20. ↑ Beckett, Lois (February 23, 2019). "'You didn't vote for me': Senator Dianne Feinstein responds to young green activists". The Guardian. Retrieved February 24, 2019. The Green New Deal could be our only hope: In praise of Alexandria Ocasio-Cortez's vision. Mia MacDonald and Gene Baur for New York Daily News. January 16, 2019.